There is something quite unique about the Middle East’s “Resistance Axis” which includes Iran, Hezbollah, Syria, Hamas and a smattering of smaller groups opposed to western imperialism and zionism. It is the only major grouping or alliance in the region that includes 1) Arab and Iranian, 2) Sunni and Shia, 3) Islamist and Secularist. This emotional link to community has often been exploited as a useful political tool to split people across national, political and religious lines. I have written before about these three “Mideast Stink Bombs,” cleverly wielded by dictators, religious extremists and western hegemonists to “divide-and-rule” the region’s populations to advantage. The Resistance Axis poses an existential threat to these antagonists, whose very authority depends on vilifying the “Other:” the longterm Saudi project to demonize the Shia/Iran; pro-US autocrats and monarchies using “radical Islam” as an excuse to exclude moderate Islamists from the political process; manufacturing an Iranian “nuclear threat” to isolate a foe and justify weapons sales and military build-ups. Instead, the rather successful alliance of Iran, Syria, Hamas and Hezbollah annihilates the argument that these “differences” are unbreachable fault lines in the Middle East. We can see with our own eyes, that here – standing strong and supportive in the face of common external foes – are Shiite, Sunni, Islamist, Secularist, Arab and Iranian. 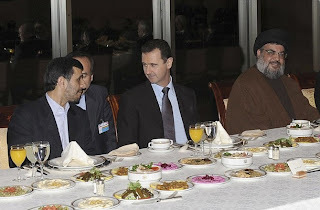 So it is not at all surprising that the moment the Arab Spring touched a member of this Axis – Syria –all hands came on board to exploit any vulnerabilities and crow about the imminent break-up of the Resistance. Actually, no. Assad and Iran and Russia and China also claim to support freedom, democracy and reform for the Syrian people. They are just as vague about from whence this freedom, democracy and reform will come as was Hanniyeh during his Friday Prayer sermon. So where exactly does Hamas stand on Resistance? And what does this mean for the future of the group and the geopolitics of the region? The Arab Spring has made way for the “established opposition” in various countries to unseat autocratic governments. 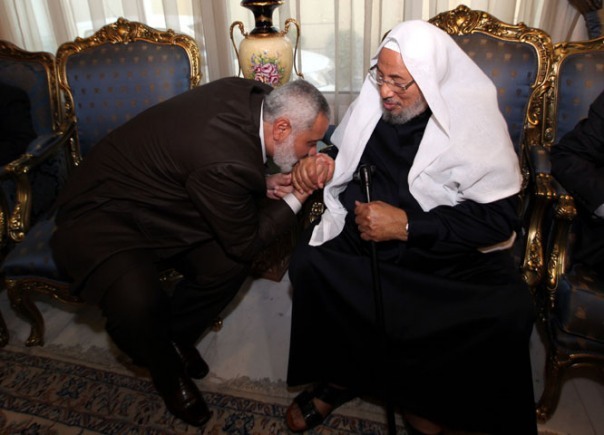 The most entrenched opponents of secular, pro-US regimes in the Mideast happen to be Islamists – most of which are of Muslim Brotherhood (Ikhwan) origin, like Hamas. But while Hamas was marked as an early “winner” of the Arab Spring – their co-religionists in Egypt were, after all, meant to sweep away the previous regime’s oppressive actions against Gaza – they instead found themselves stuck between a rock and a hard place in Syria. 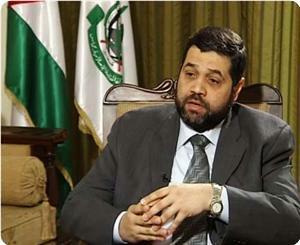 It is the old holdover of the Muslim Brotherhood in Syria that forms the backbone of the opposition there. And so Hamas found itself in the indelicate position of being expected to choose between its Islamist identity and its Resistance identity. It is worth noting that other Islamist Resistance Axis members do not seem to struggle with the issue: even other Sunni groups like Palestinian Islamic Jihad (PIJ) who have also been under scrutiny over this very issue. It really begs the question: is Hamas just too big a Resistance prize for regional players who want this Axis destroyed? The ones courting Hamas assiduously – and asking them to make these choices – are the same ones trying to break Syria’s back, isolate Iran, neutralize Hezbollah and stop armed resistance in Gaza (PIJ). Prescient statement. The Arab Awakening, of course, kicked off a few short months later in Tunisia. In other words, the Resistance Axis is not an ideological grouping – it is an opportunistic one. An alliance based more on common goals than commonalities. Does Hamas know where Hamas is going? Which brings us to today. In my view, Hamas is exploring its options right now. I have confirmation from both Hamas and Iran that financial assistance continues as before. And it seems that every time speculation about worsening relations hits a peak, a senior Hamas official pops up in Tehran to dispel rumors. Syria is a much harder problem. 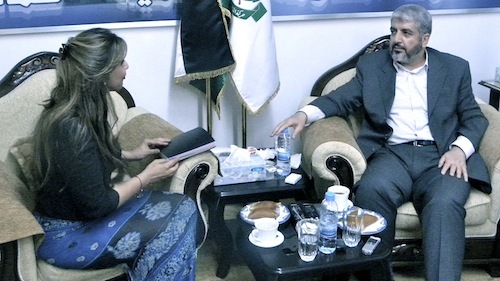 Hamas officials tell me that the reason for vacating their political office in Damascus is because other nationals were refusing to meet them in Syria. But let’s be honest, the sectarian undercurrents in both Syria and the region – fanned heavily by Saudis, Qataris, Salafists and the western cabal hyper-focused on Iran – are putting the screws on Hamas. As Hamas looks to the future and finds many natural co-religionist allies in the various Ikhwan groups emerging on the Arab political landscape, it will be faced with the same dilemma – this time from a different direction. The Islamist character of Hamas may be more fulfilled, but will there be a big gaping hole in their resistance outlook? Can the Ikhwan get them Palestine? Or can Iran, Syria and Hezbollah fulfill that long-held ambition? Part of the problem with the emerging Ikhwan political parties is that Saudi Arabia, Qatar – even the United States – are trying to guide their direction. If successful, that will not be a comfortable home for Hamas. These new “mentors” will not allow them much breathing space – these are the Old Regimes that actively support the regional Old Order and encourage “flexibility” with Israel. 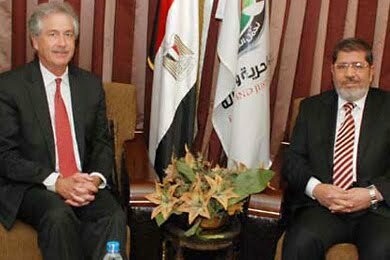 The big horse-and-pony show of a Hamas-Fatah reconciliation led to Fatah’s Mahmoud Abbas taking the lead. What became of Hamas’ awkward Jordanian visit that was only possible because of Qatari hand-holding? Fatah and Jordan are the last places to look for a Palestinian solution – they are too beholden to western interests. 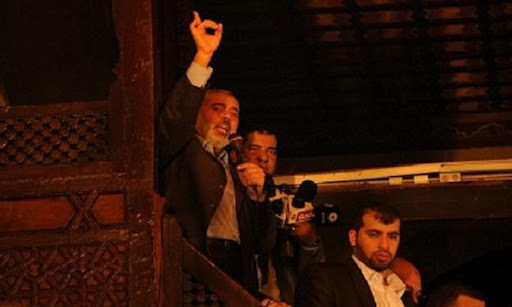 ﻿﻿Hamas may evolve in the next few years, but if it cleaves to its core values – somewhere in the middle of the current leadership’s political spectrum – I think you will find a group that will not commit itself to concepts or allies outside of those parameters. The group will talk to all players, consider all options, test the new waters of this fast-changing region – as it should. In the final analysis, it is the liberation of Palestine that bestows popular legitimacy on this group, and Hamas will need to choose the path that best serves that goal. It will take some time, but I will have my Sunni back.